The "Tidying Up" star does not have to speak English just to appease you. Everyone is obsessed with Netflix's new series Tidying Up With Marie Kondo, which encourages you to clean up your house by only keeping items that "spark joy." The show, based on Kondo's books, has become near ubiquitous on the internet, and that's because not everyone loves her methods. A few bad eggs have gone so far as to make racist comments about Kondo speaking Japanese, which she does for a majority of the show, because she's... well, Japenese. Many suggested that she begin speaking more English, and some just straight-up make fun of her accent in front of a national audience. If you haven't watched the Netflix show Tidying Up With Marie Kondo, you're missing out. Kondo is a tidying expert who literally wrote the book on the topic. The popularity of her books has reached a broader audience with Kondo's own Netflix series. On Tidying Up With Marie Kondo, she travels the US, helping families who have too much stuff and don't know where to begin when it comes to decluttering. The show's become so popular, it's reached meme status. The Jackal Group helped create the show, and its founder Gail Berman said she's been very "overwhelmed with the response." She told The Hollywood Reporter, "You know when the high school people on Facebook have come to find you and tell you about one of your shows, that it definitely hit a nerve out there." Not everyone has hopped aboard the bandwagon, though, because they think Kondo should speak English. At least, that's what author Barbara Ehrenreich said on Twitter. Barbara Ehrenreich is an author from Montana who's known for her books on political topics. For whatever reason, she tweeted that Kondo should learn English. She deleted the tweet, but the wonderful thing about the internet is that it never forgets. And Twitter was not having it with her blatant racism. The casual and maybe involuntary xenophobia that seems to frame this tweet is painful to read. So, you think America is in decline because you don't think a Japanese woman should be teaching us how to clean our homes? Would you have this same kind of energy if she was white or spoke English as her first language? Ehrenreich tried to backpedal shortly thereafter but only made things worse. In a follow-up tweet, Ehrenreich tried to explain herself by saying that she's "on the side of the clutter." However, it does sound like she just wants Kondo to speak English to her "huge American audience." Let's be clear: Kondo can speak English and does from time to time on the show. But that's why she's always joined by an interpreter, Marie Iida, who makes sure everyone is on the same page. Only then did she apologize to anyone. After those first two attempts to get the tension to die down, she finally apologized. Humor? Sure, Jan. Nice try. Some of the people responding to Ehrenreich's tweets in defense of Kondo weren't much help, either. A few tried to defuse the situation, but ended up dehumanizing Kondo all over again. This user said that Kondo speaking Japanese gives her a "fairy-like delicacy and charm." Someone else even called her a "pretty little pixie." But that's exactly the problem. Kondo isn't a "fairy" or a "pixie"; she's a human and deserves to speak whatever language she's comfortable with. The "fairy-like charm" commenter also apologized for her tweet. Katha Pollitt is also a writer and self-proclaimed feminist who called Kondo "fairy-like." After receiving pushback for her tweet, she tried to apologize by saying the tweet "clearly came across all wrong." Not everyone is crazy about Kondo's organization methods. Her tips for organizing books in particular has earned her more than enough hate from Twitter users. Calling Kondo a "monster" might seem like a pretty mild joke to some, however, this is just another instance in which she was dehumanized for her personal beliefs. Besides, she never told people that they should only keep 30 books. She merely said that's what she likes to do in her home. Keep as many books as you like at your place, though. It gets worse from there. The Guardian inadvertently poked fun at Shinto, a religion Kondo credits as part of her tidying method. 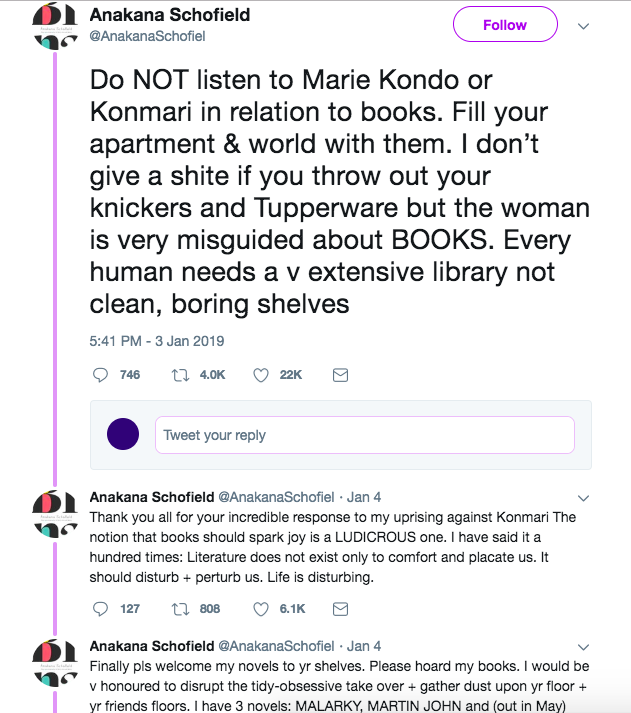 FYI: that guardian thinkpiece on Marie Kondo which - again - completely misunderstands the KonMari method, and thinks that it means only keep happy books, is also racist. The writer calls Marie's practice of waking books up - part of Shinto animism - "woo-woo fairytale nonsense." Kondo's method isn't something that she just made up. Part of her method is inspired by Shinto animism. Animism is the belief that objects are "nearly animate and deserved compassion and respect." Shinto is a religion that is part of Kondo's everyday life, so it makes sense that parts of the religion have found their way into her method of tidying. The Guardian didn't seem to care, and called her method of "waking up" books "woo-woo, nonsense." This author's tweet caused so much controversy that she made her account private. Novelist Anakana Schofield made her Twitter account private after she received backlash for her tweets. She said that "every human needs a v extensive library not clean, boring, shelves." She goes on to thank people for the response she received and even suggested they fill those shelves with her books. Classic. Even some of her American TV appearances seemed to be making fun of her. At the beginning of the year, Kondo made a few TV appearances to promote her Netflix show. Late-nights hosts such as Jimmy Kimmel seem to be making light fun of her and her methods. You can see in this segment of the show where he interviews her that he's not taking it seriously and is kind of making fun of her for laughs. Not that Kondo has to prove anything, but she can certainly speak English. Kondo is perfectly capable of speaking English. She gave an hour-long talk at SXSW in 2017 talking about her tidying method. It's 2019, people. Let's stop being racist. It's not cute, OK. America as a power is not threatened by a Japanese woman who wants us to "spark joy."